Projects - James J. Winebrake, Ph.D.
​Health Impacts of Global Shipping. This research program explores the health impacts associated with particulate matter emissions from maritime shipping. 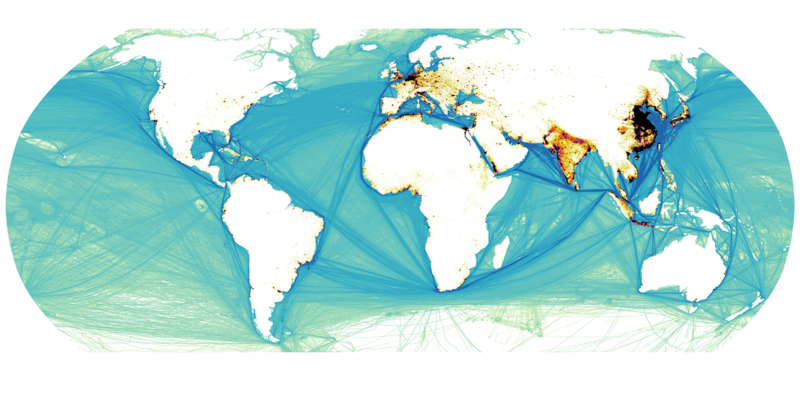 This work represents first-ever publications evaluating premature mortality from ship emissions, and has been cited as a major factor in establishing new global shipping regulations by the International Maritime Organization. Collaborators: James Corbett, University of Delaware; Ed Carr, University of Delaware; Jukka-Pekka Jalkanen, Finnish Meteorological Institute; Mikhail Sofiev, Finnish Meteorological Institute. Sustainable Intermodal Freight Transportation Systems. This research program involves a systems approach to examining the energy and environmental impacts of goods movement globally. The program brings together people, knowledge, and tools related to emissions inventories, atmospheric modeling, and environmental and health impact analysis to better understand how we can achieve a sustainable, global freight system. Collaborators: James Corbett, University of Delaware; Erin Green, Green Energy Consulting; Veronika Eyring, DLR Institut fuer Physik der Atmosphaere; Axel Lauer, DLR Institut fuer Physik der Atmosphaere; Prasad Kasibhatla, Duke University. Geospatial Intermodal Freight Transportation (GIFT) network modeling. This project develops and applies a GIS-based network analysis model to understand the environmental impacts of intermodal freight transportation and goods movement. More information can be found at the project website. Collaborators: Scott Hawker, RIT; Karl Korfmacher, RIT; James Corbett, University of Delaware. A YouTube video on the project can be found here. Total fuel cycle analysis models for landside and waterside transportation. This project develops and applies a total fuel life cycle analysis model—the Total Energy and Emissions Analysis for Marine Systems (TEAMS) model—to calculate total fuel cycle emissions from marine transportation. These results can be compared to landside emissions to determine environmental impacts of alternative transportation technologies. Collaborators: James J. Corbett, University of Delaware; Dan Yuska, US DOT, MARAD. Total fuel life cycle analysis for transportation technologies in New York. This project was supported by NYSERDA and is aimed at developing a model to assess the total fuel life cycle energy and environmental impacts of hydrogen energy use in transportation for NY State. The model involves calculating impacts for both upstream and downstream phases of hydrogen production and use. Analysis of carbon reduction policies on automobile design and market development. This NSF MUSES project aims to understand how automotive markets will respond to various GHG reduction policies. The project links together a number of computer models in novel optimization, systems dynamics, and scenario generation cyberinfrastructure. Collaborators: Steve Skerlos, University of Michigan (co-PI); Scott Hawker, RIT; Sandy Rothenberg, RIT; Tim Lipman, UC-Berkeley; Mark Delucchi, UC-Davis; Rosanna Garcia, Northeastern University; Greg Keoleian, University of Michigan; Walter McManus, University of Michigan. Heavy Duty Vehicle Regulations and Rebound Effects. This project evaluates rebound effect impacts (qualitative and quantitative) associated with new energy and environmental regulations affect the heavy-duty vehicle sector in the US. Collaborators: Erin Green, Green Energy Consulting; Bryan Comer, ICCT; Various, U.S. Environmental Protection Agency.